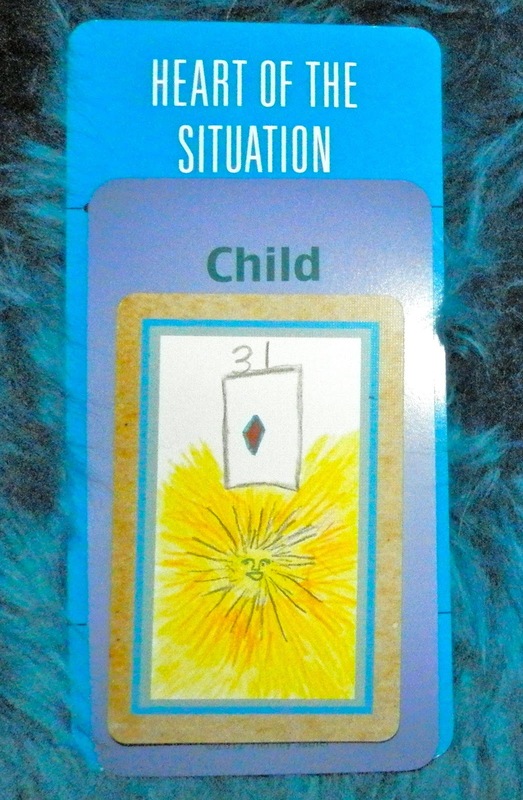 Today's Draw: Sun in the House of Child in the Heart of the Situation position from Ryder's Lenormand, the Deck of Lenormand Houses and the Deck of 1000 Spreads. What lesson is lighting up in your life right now? Where are you beginning to see the light? What's the spiritual gold star you want to earn? This is funny. Ryder's Lenormand was created by an 8-year-old boy—he did it all himself, even created his own (adorable) bags to keep them in. His mom is Rana George, is a legend in the Lenormand world. But he did all the work himself, adorning bags during his spring break. Anyway, the thing that I find funny about this is that one way of reading this combo is "at the heart of the situation is a successful child." And that's Ryder. So congratulations to him for this successful endeavor! 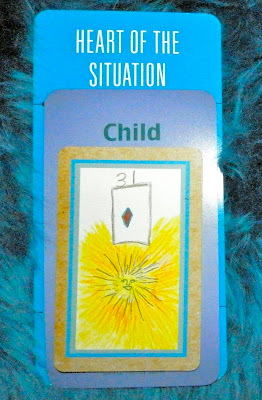 So another way of seeing Child is as a beginning. The Sun most commonly means success, achievement or even illumination of some sort. So I'm going with "beginning to see the light at the heart of the situation." That's relevant to me in many ways right now. You know, I believe there's a place in our spiritual journeys where we feel we've done a pretty good job. We're good people. We're aware of many things. And we're comfortable. But when it comes to my spiritual development, I'm always trying to push myself to over-achieve...haha. If I can. I talk about "doing the hard things" here and I know I'm not alone in doing that because I have a solid audience. There are many people who want to earn a gold star or do extra credit on their path. Although the hard things differ for different people, some of the stuff we all tend to struggle with includes letting go and surrendering fully to the universe, non-judgment and showing grace to others, regardless. It's easy to do these things under optimal conditions...to trust the universe when things are going well, to not judge when people are doing normal stuff and to show grace to people who show grace to you. But the harder row to hoe is to trust the universe when life to turns to crap, to refrain from judgement when someone offends you and to show grace to even the worst of humanity's lot. That's the gold star stuff, because it's where a lot of people fall apart and slip back into habits of negative thought and action. It's so easy to do. We all indulge in it. And I believe the lure of that comfortable place never leaves. Some of these "gold star" things hearken to the discipline of Buddhist practice for me. I'm not a Buddhist, but when you see people like Pema Chodron, she didn't get to where she is in her spiritual development and wisdom by staying in the comfortable area. I was talking to a Pema groupie about this tonight, in fact. Pema is a Buddhist nun and teacher. And she's fabulous because you know she's someone who's ahead of you on the path, but she still struggles to maintain her forward motion along that path sometimes. And she's not afraid to share her failings with you. Every once in a while, stuff happens to show her how much farther she still has to go. Just like it does for me and you. The trick is to use it as a springboard, rather than as cement shoes...haha. When it comes to spirituality, we never get "there". It's not a destination. It's a journey. We just spiral continually higher, coming to new insights and gaining new enlightenment along the way. The principle that's come back around to me lately is another of those "gold star" things. It's beautifully described in Don Miguel Ruiz's book, The Four Agreements: A Practical Guide to Personal Freedom—Don't Take Anything Personally. That's got to be the hardest thing for a human being to do...haha. We KNOW intellectually that anything another person says or does is about THEM, not YOU. But we each live in worlds that revolve around us, so we naturally assume it's about us. And boy does it push buttons of insecurity and control issues and needing to be right! And that's just the tip of the iceberg. This one, for me, brings up LOTS of stuff. Another way I've heard it said before is, "another person's opinion of you is none of your business." It literally isn't any of your business. It reflects the way they feel about themselves...their own frustrations and their own struggles with insecurity and control issues, etc.. No matter how much they want to put it on you, so it's not something THEY have to deal with, it's still not about you. You can consider it and see what relevance it has for you...what lesson you can take from it...but it doesn't belong to you. We all have our paths to walk in life. And when someone is looking over at your path and critiquing the way you're walking, the direction you're moving in and your failure to walk in the "right" direction, then they're not really focused on their own growth, are they? So why would you even listen? It's not. About. You. It's hard to keep remembering you're OK in the center of that, though. It's hard to keep focused on your path in the center of that. You get caught up in their reality...a reality that has nothing to do with your own. And then you generally get swept down into their energy and whatever it is that's going on within them. And before you know it, you're off your path. Because I haven't been good at this lesson in the past, I've allowed it to deter me and compromise my integrity to my vision. But I'm beginning to see the light.